Today while I was fixing my hair (yes, we still do that on occasion, right moms?) Phoenyx kept opening the cabinets. He would open, I would close. Open. Close. While I do have “child locks” on several of the cabinets (chemicals, etc) I haven’t gotten around to locking EVERYTHING up. Quite honestly, its a pain in the arse. So while I was standing there, rapidly losing my patience and wondering what item in my drawers I would give him that would change his focus (a floss container if you are wondering) I realized that a hair tie makes for a quick and efficient way to lock up your “french door” cabinets, provided they have knobs. Here are my new makeshift bathroom ones….which work perfectly and look a lot less intrusive. Plus, I have about 400 hair ties lying around, so it was a free and quick option for the moment I needed one. 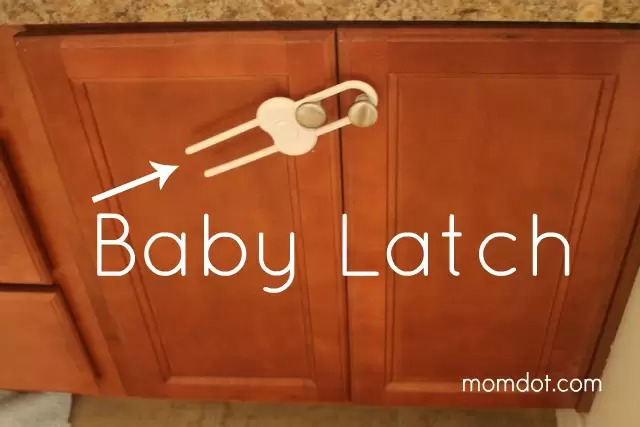 I still recommend getting strong locks for anything that could be a potential hazard to a child, but this will totally work for the times that you are playing the “open” “close” game with your baby! P.S. Here is my hair all fixed after I got to concentrate on that instead of the cabinet game. We have a cabinet in the garage that the doors don’t catch anymore and stay closed so hair ties have worked to keep the doors from opening and me from whacking my hip or head on them. 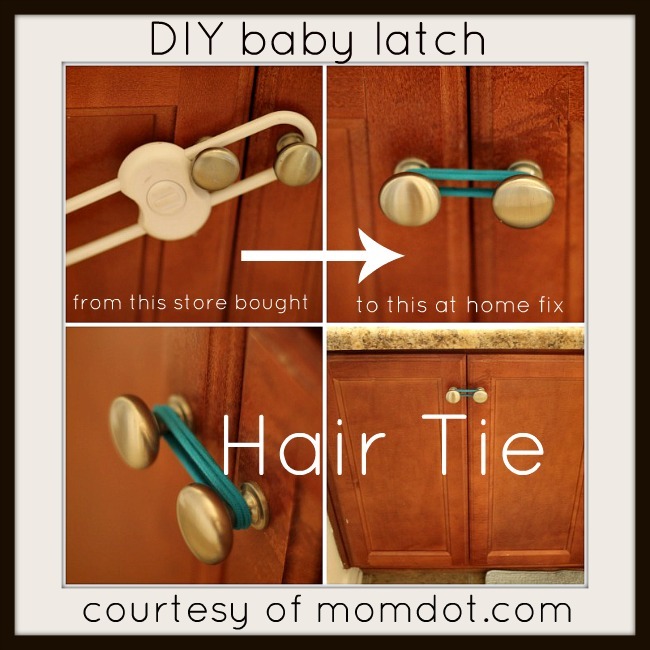 When my daughter was little, I cut fabric to get her to stop going in the front door cabinet! I love how you think! This has been my mom’s go-to option for years for when grandbabies come to visit. My son was able to get into a lock we used. We thought we outsmarted him with the magnetic locks in the kitchen and nope…the darn smartie pants took his Thomas the train that was magnetic And rubbed it to open the lock. While it didn’t open (not strong enough) he had the concept down. So then we had him scratching our cabinets with random magnetic things. You are so adorable and smart.